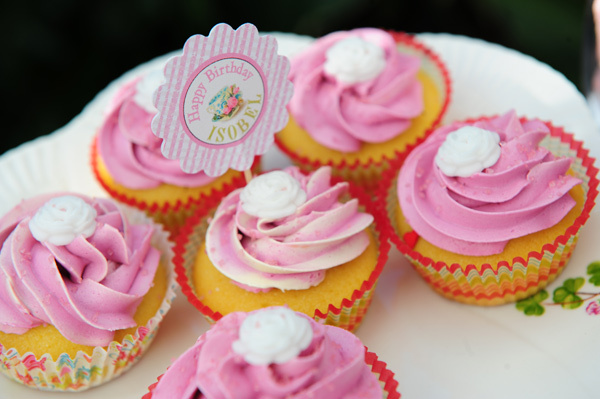 Here’s a pretty party that’s close to my heart. 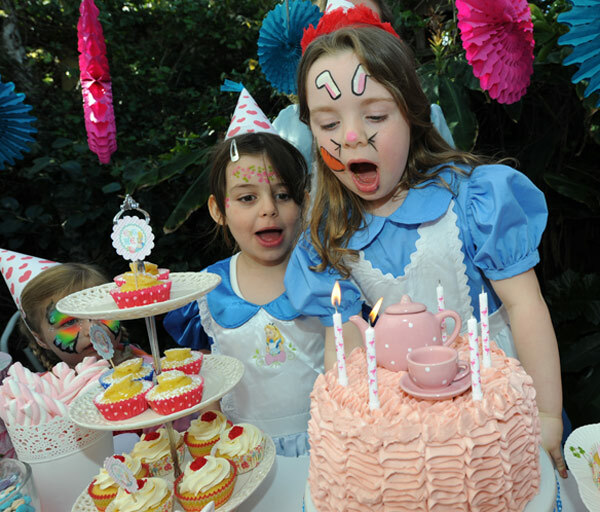 It’s my own daughter’s Alice in Wonderland celebration, so cue the rabbit hole and come take a look! 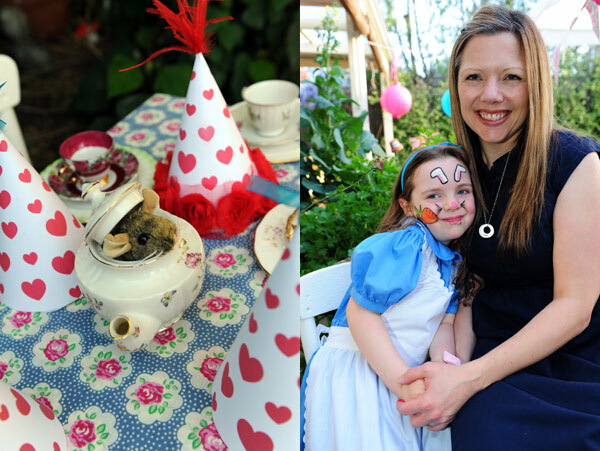 It hardly seems a year ago that I took you inside Isobel’s fairy garden party, and here we are again with a wonderfully whimsical Wonderland soiree for her fifth birthday that had everything except a Mad Hatter! And that’s only because I couldn’t convince my husband to put on a top hat! I’m not sure who had more fun – me putting the party together or my daughter and the nine friends she invited to share her special day. First up, I called once again on the awesomely talented Simone at Invite Me to help with an invitation and here’s what she came up with. Perfect! 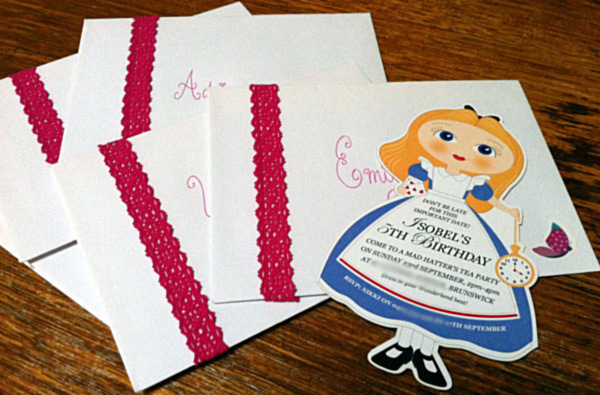 I prettied up the envelopes with some pink crochet lace tape – you can find similar fabric tapes locally at Chibi Run. 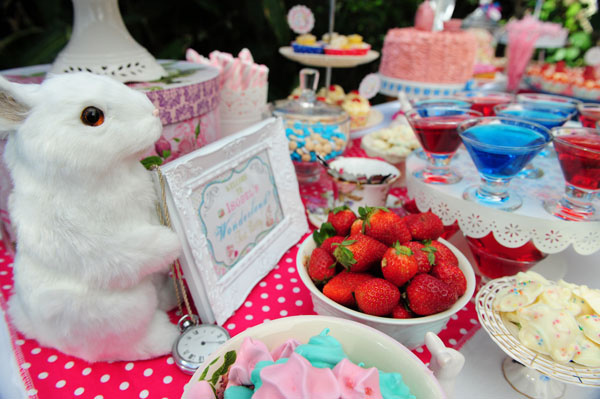 For the celebration itself, I wanted something terribly chintzy and over-the-top eclectic with an old-fashioned garden party feel – much like I’ve always imagined the tea party scene from Lewis Carroll’s classic book. 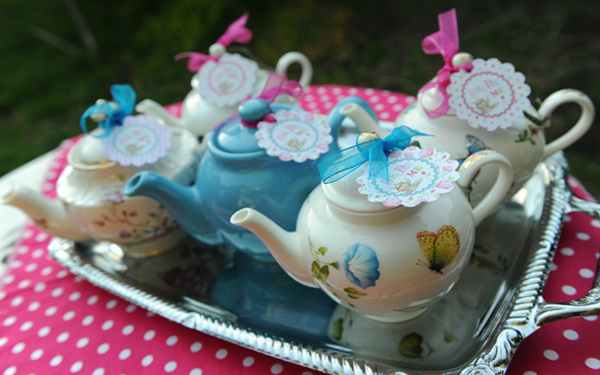 So, party tragic that I am, I spent months and months tracking down vintage demitasse cups and cake plates from op shops and markets all over the place, and then sourced teeny-tiny teapots (used to hold pink lemonade) all the way from the States to go with them.The girls loved pouring their own ‘tea’ and using real china! That same whimsical, shabby chic vintage vibe was in the oversized ‘this way, that way’ signs from Etsy’s Ian and Lola that set the scene as guests arrived. 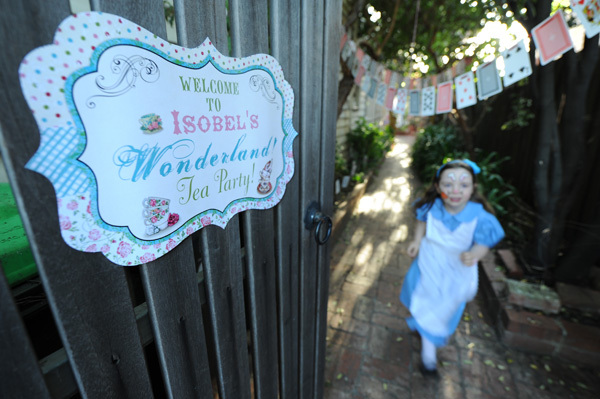 Ian and Lola customised an entire set of Wonderland printables for Isobel’s party, including a darling welcome sign for the gate (below) as well as Drink Me, Eat Me and Take Me tags. 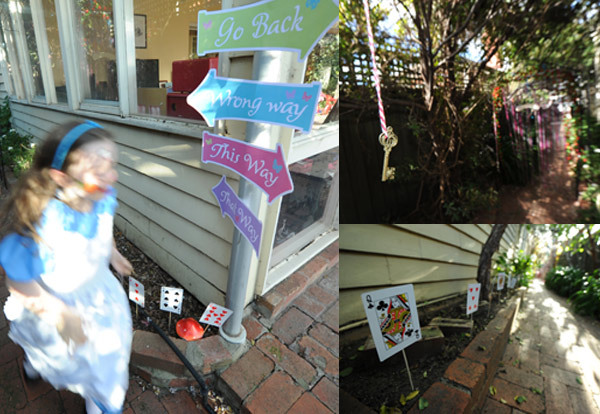 Other decorations included paper lanterns and tissue paper fans in the party colours of turquoise blue and hot pink, delicate butterflies, white rabbits galore and oversized playing cards from The Reject Shop that I threaded onto red ribbon to make bunting for the side path leading to our back garden. I hung it low enough so the guests would have to stoop in spots to get underneath – just like crawling through a rabbit hole! More cards lined the pathway – I simply taped them onto thick wooden skewers and pressed them into the garden beds, while old-fashioned keys found on eBay dangled from trees alongside the card bunting. 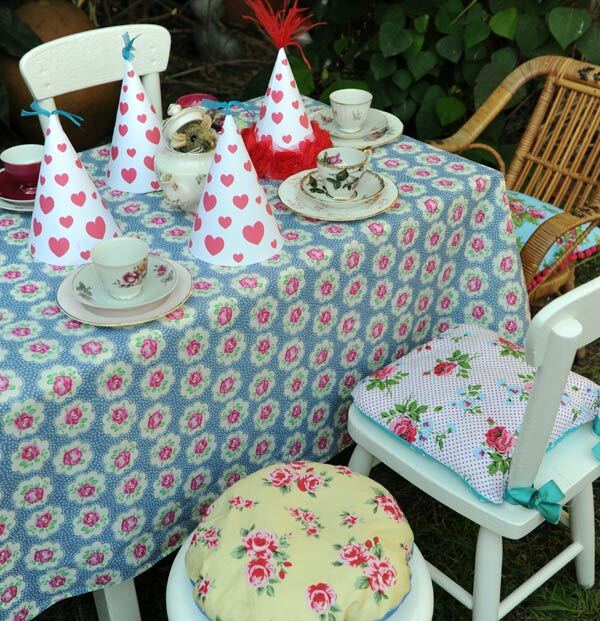 My lovely mother-in-law sewed metres and metres of fabric bunting to decorate the party marquee and even made matching cushions for the chairs. I made the Queen of Hearts party hats using a free printable from Mr Printables, then simply zhuzhed them up with some turquoise organza ribbon for the guests and some ostrich feathers and fancy red tulle roses found at Spotlight for the birthday girl. 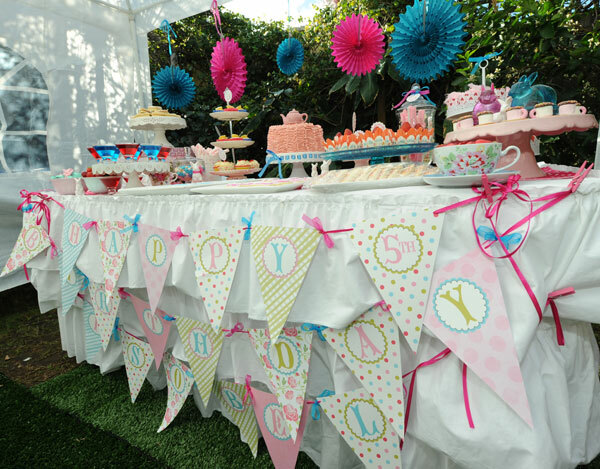 Now on to the sweets table, decorated ever-so-prettily with a ruffled tablecloth and pink spotted table runner sewn by my mum and a happy birthday banner from Ian and Lola. 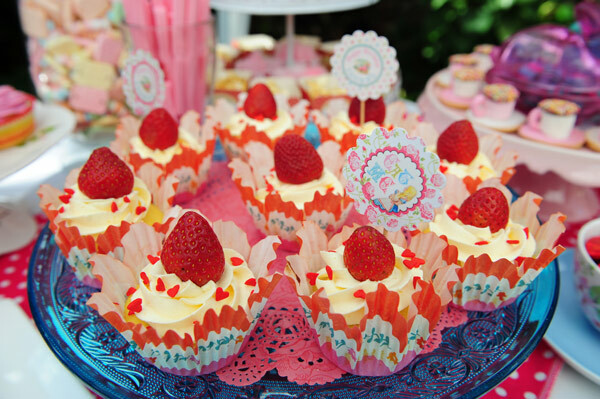 I went a little silly, with all sorts of treats from jellies, caramel popcorn and teapot-shaped sugar cookies to lemon curd cupcakes, vanilla cupcakes topped with strawberries or fondant roses, and heart-shaped jam shortbreads. Apart from the fairy floss, I’m proud to say I made it all myself. (Yep, there were a LOT of late nights in the lead-up to this party). 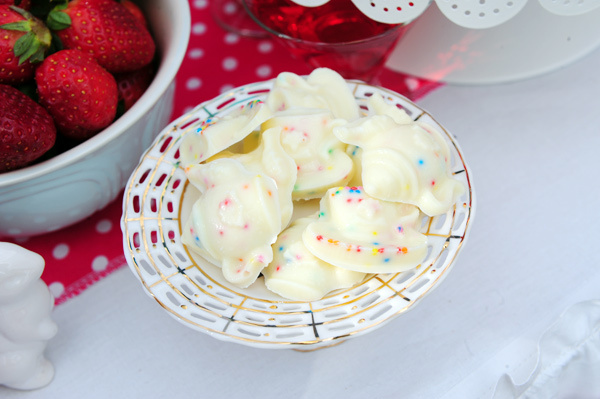 I also made teapot and teacup shaped white chocolates using a mould found online at Amazon. 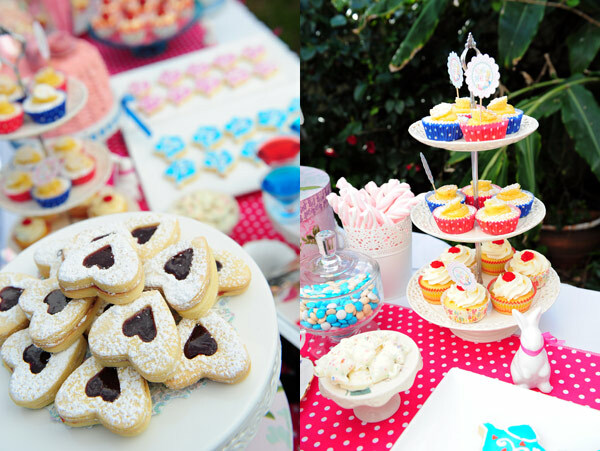 And I have always wanted to make those little retro teacup treats – you know, the ones made from Tic Toc biscuits, marshmallows, Freckles and Lifesaver lollies. Well, here they are! 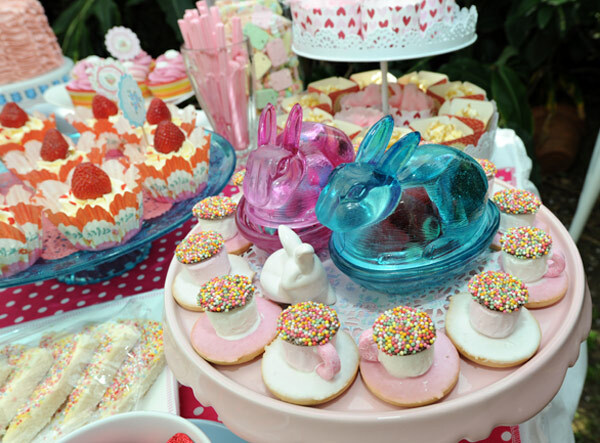 Boiled sugar sweets and strawberry rock candy took pride of place in those two completely kitschy rabbit-shaped jars I found at the Reject Shop back at Easter (and in my party colours too!). 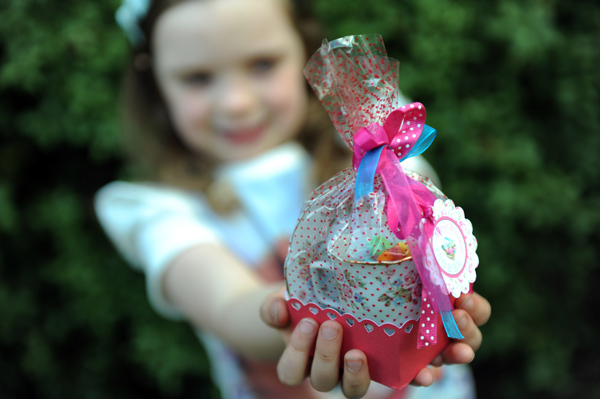 Another glass jar from Invite Me was filed to the brim with watch lollies, and of course we needed musk sticks, marshmallow wands, pastel M&Ms and red heart chocolates as well. It wasn’t all sugar. The girls also nibbled turkey and cucumber sandwiches – crusts removed, of course – and home-made chicken sausage rolls before attacking the sweets table. 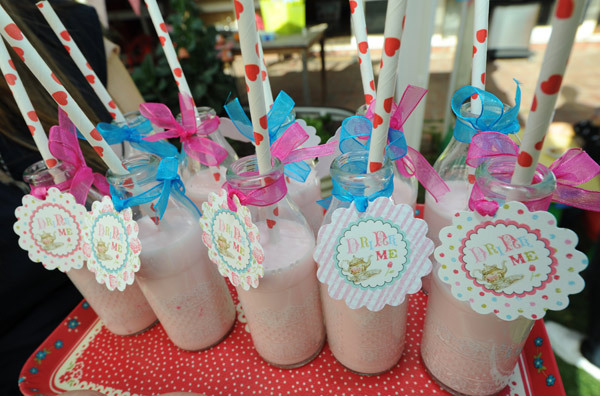 They also enjoyed pink milk, sipping it through cute heart paper straws that were another Invite Me find. 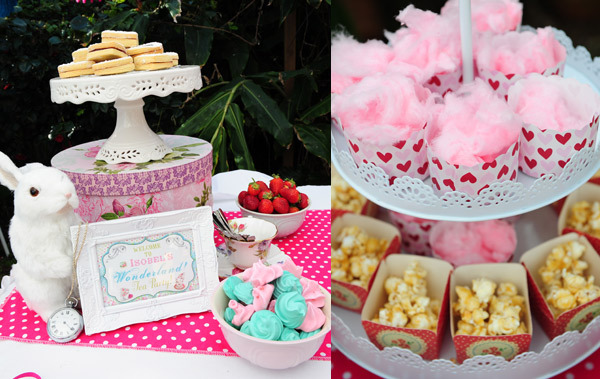 The pretty tiered cake stand used to hold the fairy floss and popcorn came from Lark, as did the sweet little paper boxes holding the popcorn, the bowls holding the strawberries and meringues and the small botanical cake stand used for the dainty white chocolate teapots. I found the other metal stand used for the jellies and the stunning blue glass stand at Bon Bon Boutique. 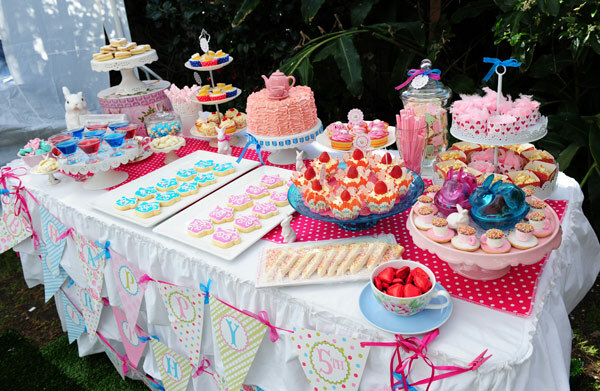 Many of the other cake stands were already in my collection (sheesh, at last count I own nineteen!) but let me know if there’s one here that catches your eye and I might be able to tell you where I got it! The ruffled birthday cake was a white chocolate number, layered with white chocolate ganache and lemon curd, then topped with Sweetapolita’s Swiss meringue buttercream. The cake recipe came from Zoe Clark’s fabulous book, Cake Decorating at Home. 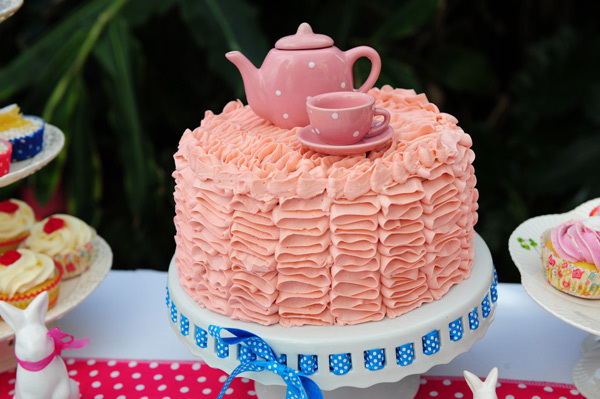 I so wanted to try a teapot shaped cake but my Miss fell in love with the ruffled cake from another reader’s Marie Antoinette party, and so pink ruffles it was! I have to tell you, it’s easier than it looks! The cute little teapot and teacup on top came from Big W and I found those perfectly Alicey flamingo candles (below) at my local IGA supermarket. With all that food to prepare, I wisely decided to call on outside help to keep the party guests entertained and Siana from Zing Kidz in Melbourne came to my rescue. The most down-to-earth Alice ever, she had all the kids in stitches with her magic show and won them over completely with some glittery face painting. With dancing, balloon art and a real-life rabbit to pat, the guests didn’t have even a nano-second to be bored. 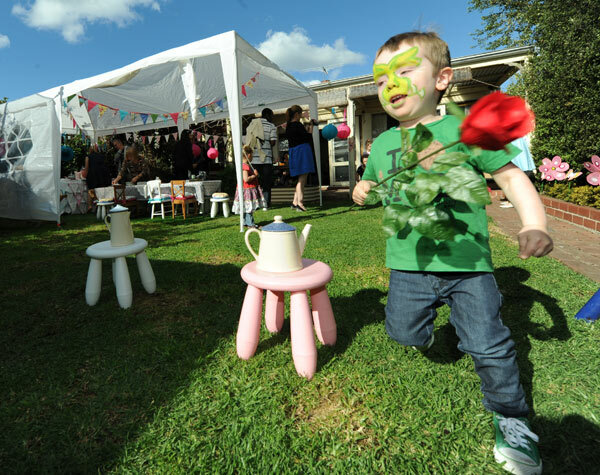 She even threw in a few Wonderland-esque games, like this round-the-teapots roses relay and a sugar cube tossing game, much to their delight. 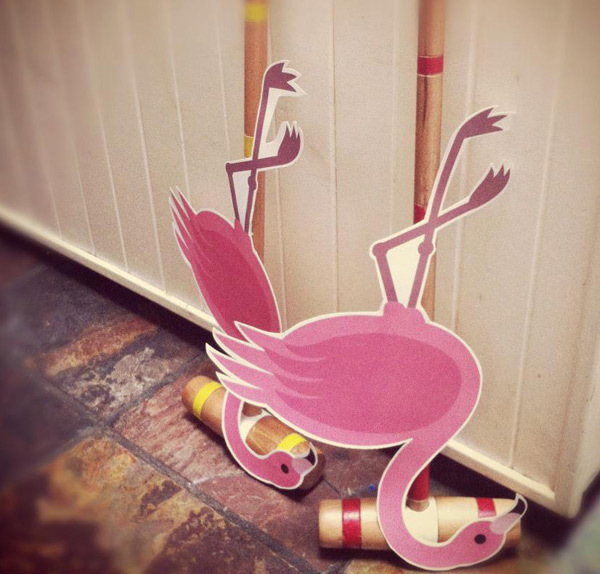 I also made flamingo croquet mallets, with a little hedgehog ball to boot, but by the time the girls got around to playing it, my husband went on a photography strike, claiming I had enough photos already. So you’ll have to make do with one I took as I was making them. 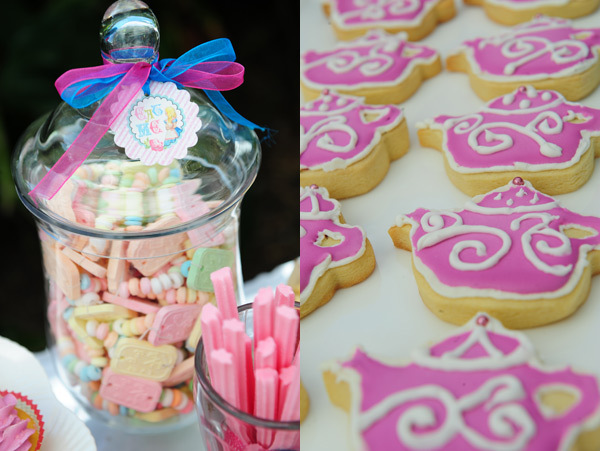 To finish, each guest took home their own little teacup, wrapped in a cute Martha Stewart gift bag, topped with a ‘Take Me’ tag and filled with miniature boiled lollies. Now, no Alice party can really be complete without a resident dormouse, and here’s ours. The girls got a thrill to find him peeking from his own little teapot on their table. Then here I am, Babyology’s resident party tragic, with my beautiful birthday girl.